It was with great shock and sadness that CLG Dún na Mainistreach / Baile na Cúirte learned this afternoon of the passing of our great club man and friend, Séamus O'Brien. Séamus' association with our club goes back decades, from donning the jersey in his younger days to almost every administrative role on the Club Executive Committee. His encyclopaedic knowledge of the GAA Rule Book made him the first port of call when any issue needed to be clarified. 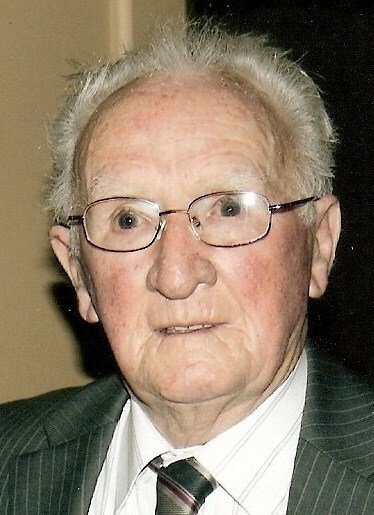 A gentleman to the core, his wisdom, friendship and dedication to Abbeyside / Ballinacourty GAA Club will be sadly missed. To his sons, daughters and extended family we offer our sincere sympathies. Ar dheis lámh Dé go raibh a anam dilís. Our popular Jack the Joker Fundraiser will continue this Sunday night in Kennedy’s Live where the Jackpot will be €12,350 as on Sunday night Mousies Staff were drawn out of the drum but did not find the Joker, however they did win €50, while Orla Fennell and Neil Moore won €25. The following are the numbers that haven’t been turned yet 3, 11, 18, 30, 39, 40, 41, 43, 44, 45, 47, 48, 49, 50, 51, 52. On Wednesday evening last we took on Ardmore in our third game of the County League and at the end of an entertaining game of football we emerged as narrow winners. TEAM: R. RYAN, D. COLLINS, T. HANRAHAN, M. LAVAN, N. DEE, P. LYNCH, J. POWER, M. FIVES, C. MOLONEY, S. O’DONOVAN, P. HURNEY, E. COLLINS, C. KINDREGAN, J. O’BRIEN, D. POWER. SUBS: D. FERNCOMBE, L. HURNEY. On Monday we play Ballyduff Upper in the County League in Ballyduff at 2:30 pm. On Sunday afternoon last we got our Western Championship Campaign back on track with a one point win over Ballyduff Upper in Cappoquin. A strong second half display was crucial to victory here as we trailed by seven points at half time. TEAM: R. RYAN, S. O’CONNOR, J. MOORE, D. DEE, J. RYAN, T. HANRAHAN, E. BERGIN, L. HURNEY, M. LAVAN, E. ENRIGHT, E. COLLINS, C. KINDREGAN, D. FERNCOMBE, J. POWER, D. POWER. We play our third game of the Western Championship on Friday night when we take on Clashmore at 7:30 pm in Fraher Field. Our Bingo continues this Sunday night in the CBS Hall where the jackpot is €700. On behalf of all in the club we would like to wish the Waterford Senior Hurlers and Footballers the very best of luck ahead of their opening Championship games this weekend. Garry, John and Patrick Hurney, Shane Briggs, Sean O’Hare and Stephen Enright are all on the football panel while Richie Foley is on the Hurling Panel. Croke Park has advised that official GAA membership cards will not be available for 2013. A review is taking place on a cost and benefit basis for next year. Having played no game in the Division 1 hurling championship up until last week despite it being on round 4 we finally got our campaign of to a start and travelled to Waterford to play Ballygunner last Monday. We played some good hurling and came away with a win. We travelled to Lismore Wednesday night and also had a good result there. Four points from the two games played so far. Next games here are home to St Pats, away to Mt. Sion and home to De La Salle. Our second team played St. Saviours at home and this was a really entertaining contest and was very close throughout. Our boys finished the stronger and got two late goals to win the game. Next up here is An Ghaelteacht followed by Fourmilewater . Panel: Aaron Beresford, Tommy Walsh, Shane Ahearne, Cian Fagan, Padraig Moore, Bearach Moore, Gearoid Hallinan, Sean Crotty, Sean Whelan-Barrett, Shane Kiely, Ben Flynn, James Riordan, Jack Kiely, David Montgomery, Dean Beresford , Jamie Walsh, Mark Twomey, Meldan Dwyer, Daithi Brunnock, Johnny Treen, Michael Kiely, Sean Kent, John Power, Jack Dwane, Paddy Dwane, Cian Power, Eoin Ahearne, Danny Reynolds, Jake O’Riordan, Cian O Riordan, Jake O Riordan, Ruairi Cusack and Fergal Roche. We travelled to Dundrum last Saturday to compete in an under 11 and 12 blitz. We played Ferbane in the first game and both our teams played well and won both games. Next up was the host club Kickhams where team A drew the game and team B won their game. We were then in the final of both cups. Our players were starting to tire and unfortunately we did not win any of the finals against Midelton and Na Piarsaigh but hurling was the winner on the day with some great displays from several of our players. It was a long day starting at 10.30 am and ending at7pm. Thanks to the parents who drove and all the players for their efforts. We will have played our next under 12 fixture on Tuesday night against our neighbours Dungarvan by the time the notes are printed and our under 11 are also playing them next Friday evening in the Town & Country League. Training continues every Wednesday at 6 pm. The Kellogg's Cul Camp takes place from July 1st to 5th this year for boys and girls from age 6 and up. Registration can be done on line at Kellogg's Cúl Camps or by contacting your club coordinator Carmel on (087)2598923. Outdoor hurling continues every Saturday morning from 10.30 for boys age five and up. Helmets and Hurley's can be purchased through the club at a discounted price. We would like to wish Sean Kent and Jamie Walsh the very best of luck ahead of their Primary Games appearance this weekend. On Saturday Sean travels to the Kingdom to play for the football side whilst on Sunday Jamie will play on the Hurling team in Thurles. On Tuesday last the Western Finals of the Primary Schools Hurling and Camoige Competitions took place in Bushy Park. Scoil Mhuire took on Lismore in the hurling final and at the end of a great game the sides were level so a replay will go ahead next week. In the Camoige final the Garranbane girls played with great spirit but were beaten by a strong Lismore side. We congratulate both schools on reaching the finals and thank the teachers for all the hard work they put into training the boys and girls. Training continues every Friday night for all age groups from 6:30 to 7:30. The U14 girls played their last game in the league away to Ferrybank last Tuesday night and came away with a well earned win. Two of our girls will represent their schools this weekend in the Primary game during the Munster championship, Kayleen O Donnell travels to Killarney on Saturday to play in the football, on Sunday Amber Kinghorn travels to Thurles to play during the hurling. Well done to both we know ye will do both school and club proud. 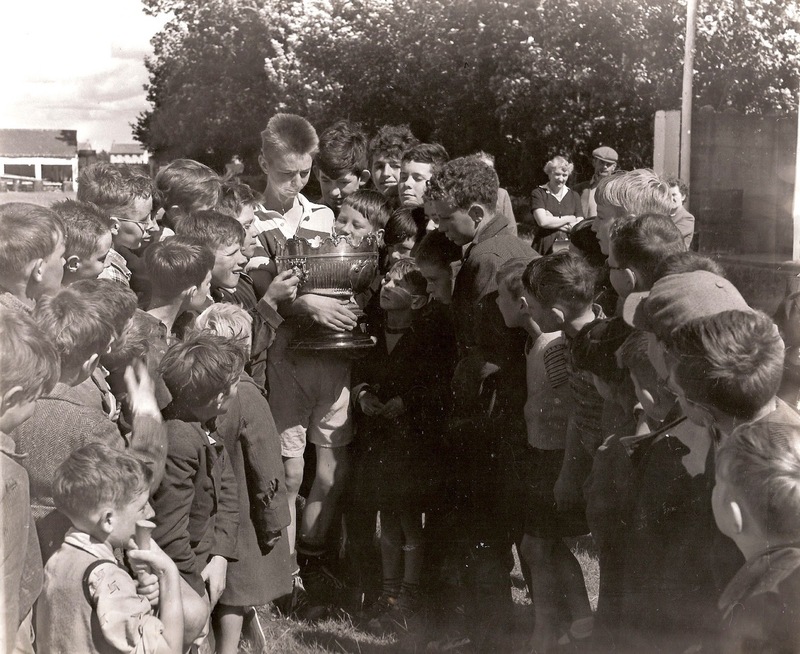 This week's photo shows Scoil Mhuire captain, Tommy Leahy and schoolmates with the Sheehan Cup won by the school after beating Ballygunner at the Showfield, Dungarvan in 1957. Tommy was joined by the following in the final of this National Schools Hurling competition:- R. McGrath, J. O'Regan, D. Egan, R. Cashin, V. Condon, N. Browne, M. Kelly, T. Kiely, A. Cashin, A. McGovern, P. Breen, P. Enright, S. Whelan and J. Breen. Our popular Jack the Joker Fundraiser will continue this Sunday night in Kennedy’s Live where the Jackpot will be €12,048 as on Sunday night Martina, Kathleen and Kevin were drawn out of the drum but did not find the Joker, however they did win €50, while Laurence Power and Peter Goodwin won €25. The following are the numbers that haven’t been turned yet 3, 11, 18, 23, 30, 39, 40, 41, 43, 44, 45, 47, 48, 49, 50, 51, 52. On Friday evening last we took on Tallow in the County League and at the end of a high scoring game we emerged victorious. Our next game is away to Ballyduff Upper on June 3rd. This Sunday we play Ballyduff Upper in our second game in the Western Championship in Cappoquin at 2pm. Our Bingo continues this Sunday night in the CBS Hall where the jackpot is €650. The Kellogg's Cúl Camp takes place from July 1st to 5th this year for boys and girls from age 6 and up. Registration can be done on line at Kellogg's Cúl Camps or by contacting your club coordinator Carmel on (087) 2598923. Outdoor hurling continues every Saturday morning from 10.30 for boys age five and up. Helmets and Hurleys can be purchased through the club at a discounted price. Our minor football team travelled to Bushy Park on Saturday morning last to take on local neighbours Dungarvan in the semi final of the county minor football championship. This was a keenly fought affair between two very evenly matched sides. After normal time the teams were level but in extra time Dungarvan scored two goals and went on to win by 3 points in the finish. Great credit must go to our team and the team management for their outstanding effort this year. We have struggled at this level over the last couple of years and it is great that we competed so strongly this year. The hurling is next for this group of players after the Leaving Cert and we hope that they show as much commitment to the hurling as they did for the football. Congratulations are extended to all those children around the parish who made their First Holy Communion last weekend or those who will make it this weekend coming. The under 10 team travelled to Carriganore on Saturday morning last to take place in blitz games. The team had a great day out and everyone seemed to go home happy. The under 14 hurling team played Dungarvan in the Western Championship last week. After playing a nice brand of hurling they came away with a deserved win. Training continues every Friday evening for all age groups starting at 6.30 and on Tuesdays at 7.00pm for U12. Our U12 travelled to St. Molleran’s on Saturday last to take part in a blitz. A great morning was had by all with some great games played. This week's photo shows the official programme and team sheet for the 1993 County Minor 'A' Football Final between Abbeyside and Tramore held at Stradbally. A disastrous start saw the Village boys concede a goal in the opening minute and trail by six points at half time. A stirring second half fightback wasn't enough as the team went down to a 2-8 to 1-9 defeat. Our popular Jack the Joker Fundraiser will continue this Sunday night in Kennedy’s Live where the Jackpot will be €11,756 as on Sunday night Michelle Foley was drawn out of the drum but did not find the Joker, however she did win €50, while Mary Kiely and Ella McGrath won €25. The following are the numbers that haven’t been turned yet 3, 9, 11, 18, 23, 30, 39, 40, 41, 43, 44, 45, 47, 48, 49, 50, 51, 52. On Saturday evening last we played Mt. Sion in our second game of the County Championship in Fraher Field. Despite an improved performance from last week we were defeated by three points. Our next game is against Ballygunner in June. TEAM: S. ENRIGHT, J. POWER, S. O’HARE, E. COLLINS, S. O’DONOVAN, J. GORMAN, J. HURNEY, D. COLLINS, M. O’HALLORAN, T. HANRAHAN, G. HURNEY, M. FIVES, M. FERNCOMBE, P. HURNEY, M. GORMAN. SUBS: S. DALY, R. FOLEY. On Sunday afternoon last we suffered a heavy defeat to Ballinameela in our second game of the Western Championship. We would like to pay a special thanks to all the minor players who played this game as we were short a number of regulars on the day and all these young players certainly have a good future in the club. TEAM: L. POWER, T. MURRAY, J. MOORE, S. O’CONNOR, J. DUGGAN, E. BERGIN, C. KINDREGAN, N. DEE, E. CROTTY, L. HURNEY, D. HICKEY, P. COLLINS, S. SLATER, T. McGRATH. Our Junior hurlers got their Championship campaign back on track on Friday night last with a very good win over Geraldines in Bushy Park. TEAM: S. KIELY, J. WALSH, P. BREEN, A. O’RAGHNAIGH, C. ENRIGHT, L. BERESFORD, D. HENLEY, J. RYAN, B. WALSH, S. FLYNN, R. RYAN, E. YOUNG, M. KELLEHER, I. KIELY, G. FLYNN. We play Tallow this Friday night at 7:30 in Abbeyside. Our Bingo continues this Sunday night in the CBS Hall where the jackpot is €600. Last Wednesday evening in Walsh Park our under 14’s had a memorable evening by qualifying to represent the county in this year’s Feile hurling tournament by beating De Le Salle in the county final. This was the last of four games we played to qualify. We played Dungarvan, Lismore and the Brickeys along the way but the final was a tremendous game against the Eastern winners. From the throw in this game was played at a high standard and high intensity with both teams really up for the challenge. There was very little between the two teams throughout, with the Abbeyside boys finishing the stronger to force a draw at full time. As a winner was needed on the night, we played five minutes a side extra time, at the end of the extra time both teams were still level. A second lot of extra time was required. The city team went two points ahead as we went into the final few minutes but our boys never gave up and finally got the score we needed, a super goal to put us ahead. This turned out to be the final score of the game; 3-8 to 2-10. This was a super game of underage hurling where both teams really played their hearts out, with tremendous spirit and without a malice strike in the whole game. All players on both teams should be proud of themselves. The only negative point of the game was Tom Looby who received a leg injury. We would like to wish Tom a speedy recovery. This was a great achievement for the players to qualify for both hurling and football Feile finals in the one year. This is first time ever in the club and only the third time ever in the county. We are currently in the middle of fundraising and working out the logistics of both trips. Update will be given to all players this week. Our minor football team had two home games in the last week. The first was against Gaultier and the second was against Rathgormack. We played some good football in these games and won both to qualify for the semi finals. The semi final will take place on this Saturday coming in Bushy Park and we wish everyone involved well. The Kellogg's Cul Camp takes place from July 1st to 5th this year for boys and girls from age 6 and up. Registration can be done on line at Kellogg's Cul Camps or by contacting your club coordinator Carmel on (087)2598923. Membership for the club for this year is now overdue so if there is anybody who hasn’t yet paid the membership could they do so please as quickly as possible. Training continues every Friday evening for all age groups from 6.30 to 7.30 pm and on Tuesday evening for U12. On Saturday last our u10 & 8 travelled to Ring to play in their first blitz. A great morning was had by all. Our U14s played at home to Clonea on Tuesday night last and will travel to Cappoquin this week to play Cappoquin. This is the league table after the second round of games in Abbeyside’s County Senior Hurling Championship Group. The first four teams qualify for the quarter finals. Back Row (L to R): J. O'Connor, J. Clancy, N. Hayes (background), Paddy Whelan, J. Cripps (background), A. Flynn, L. Whelan, P. O'Connor, L. O'Dea, G. Flynn, Fr. M. Walsh, CC, M. Fives. Front Row (L to R): P. Browne, Patcheen Whelan, M. Farrell, N. McGovern, M. Organ, D. O'Connor. Seated in Front: J. Leahy, J. Hogan. Among Boys on Left: J. Flynn, G. Keating. Boys on Right: C. Fives, G. Fives. 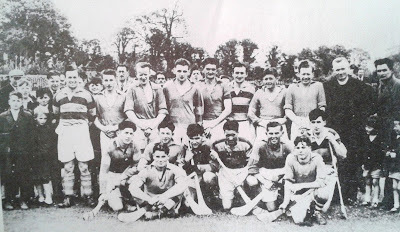 This week's photo brings us back to 1953 and the first Abbeyside team to win a match in Senior Hurling Championship. Having gone out in the first round of their first two senior campaigns, the Village men were anxious to stamp their mark on the premier hurling competition in the county. Early season challenge games prepared the team for the battle with Dungarvan in the opening round. A hard fought game at Fraher Field saw Abbeyside come out on top by 4-5 to 2-4. 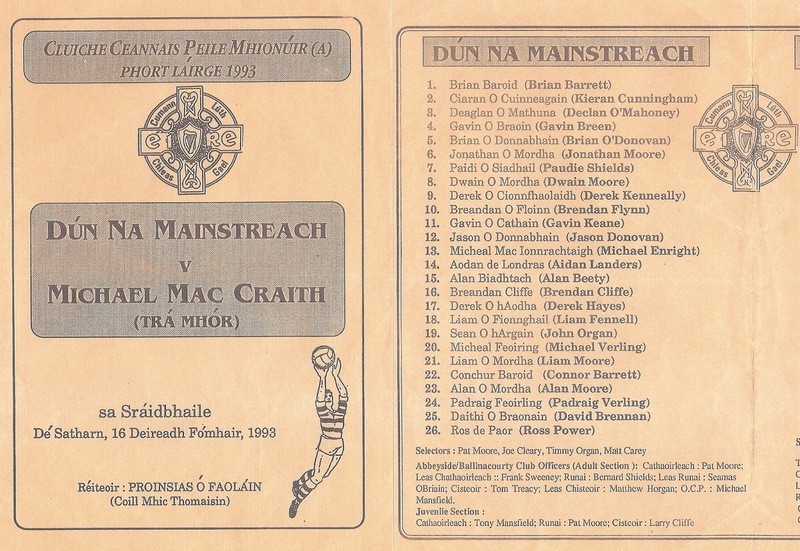 Interest in that year's championship ended with a third round, six point defeat to Mount Sion, 3-9 to 2-6. Our popular Jack the Joker Fundraiser will continue this Sunday night in Kennedy’s Live where the Jackpot will be €11,464 as on Sunday night Eileen O’Donovan was drawn out of the drum but did not find the Joker, however she did win €200 which was the Bank Holiday prize, while the Cosgarve Family, Tournore and James Tobin won €25. The following are the numbers that haven’t been turned yet 3, 9, 11, 18, 23, 30, 32, 39, 40, 41, 43, 44, 45, 47, 48, 49, 50, 51, 52. On Saturday evening last we were defeated by Passage in Fraher Field in the first round of the Senior Hurling Championship. This week we play Mt Sion in Fraher Field at 7:30 on Saturday evening. We were defeated by Shamrocks on Sunday evening last in Lismore in the first round of the Western Championship. This Sunday we play Ballinameela in Lismore at 2pm. Our Junior hurlers were defeated by Brickey Rangers on Monday last in the Western Championship and this Friday night they play Geraldines in Fraher Field at 7:30. The Club had two winners in the Deise Draw which took place on Friday night last with Roisin Murray winning the top prize of €10,000 and Marie Kenneally won €200. On behalf of all in the club we would like to congratulate Gary Hurney and Tammy Hehir on the birth of their baby son Jarlath over the weekend. The Kellogg's Cul camp takes place from July 1st to 5th this year for boys and girls from age 6 and up. Registration can be done on line at Kellogg's Cul Camps or by contacting your club coordinator Carmel on (087) 2598923. Outdoor hurling continues every Saturday morning from 10.30 for boys age five and up. Helmets and Hurlies can be purchased through the club at a discounted price. On Sunday last as part of the Maritime Festival in Dungarvan the juvenile committee ran a very successful duck race. The money collected goes directly towards to the juvenile committee and a special word of thanks must go to everyone who sold tickets for this event and those who helped out in retrieving ducks after the race. .It was great to see so many of the juveniles of the club involved in this very successful fundraising event. The winners on the day after a tight finish were 1st Bearach Moore, 2nd Sandra Cliffe and third was Harvey Fitzgerald. Again a big thank you to everyone involved. After a few weeks in the wilderness we played our third round of the minor football championship on Thursday last at home against De Le Salle. In this game we were very efficient in front of goal and came away with a well deserved victory. On Monday last we defeated Gaultier and tonight, Wednesday, we play Rathgomack in Abbeyside at 7:30 pm. On Wednesday night last week we took on Dungarvan in the final of the Western under 14 Feile Hurling Final. After a very tough battle throughout we came away with a narrow win. We now go on to play De Le Salle in the county final of this competition in Walsh Park on this Wednesday night (8th May) and we wish everyone involved the very best of luck. Our U12 girls played their third blitz on Saturday last. Venue was St. Anne's Dunhill with matches against St. Anne's and Butlerstown. The games were very competitive with our team showing great improvement in skill level. Next blitz is May 18th St. Mollerans / Clonea. U12 training continues Tuesday evenings at 7pm. This Saturday May 11th our U10 & U8s play in Ring in their first blitz for this year. Training continues every Friday evening at 6:30 for all age groups and on Tuesday at 7:00 for U12s. This is the league table after the first round of games in Abbeyside’s County Senior Hurling Championship Group.